Alberta's coal-fired power plant operators are planning to cheaply convert plants to burn natural gas. National emissions standards should not be relaxed to extend the life of what will still be high-emission power plants. Power plants in the EU will have to cut the amount of toxic pollutants such as nitrogen oxides they emit under new rules approved by a majority of member states. Friday’s decision imposes stricter limits on emissions of pollutants such as nitrogen oxide, sulphur dioxide, mercury and particulate matter from large combustion plants in Europe. The European Power Plant Suppliers Association (EPPSA) said they welcomed the move by the Industrial Emissions Directive (IED) Article 75 Committee members on the Best Available Techniques Reference Document for Large Combustion Plants (LCP BREF). Several countries which are heavily reliant on coal, such as Poland, Bulgaria, Germany and the Czech Republic, were opposed to the changes. ...EPPSA also said it believes that for most of the existing LCPs, the implementation of the conclusions are economically and technically feasible through the state-of-the-art technologies currently available in the market. Some history from the United States indicates the saving of some emissions reductions, such as mercury, may not justify the costs, whereas the reduction of others do - often in conjunction with reducing mercury. Courts ruled the Environmental Protection Agency (EPA) had not properly considered compliance costs, in 2015, but did not require the rule rescinded and subsequently rejected attempts to nullify the standard. Meanwhile, most plants had complied with the rule - or closed. aside: India also introduced standards - but not the enforcement of standards. The new EU power plant emissions regulations appear to borrow wisely from the American experience. European cities are living through an “airmageddon”, with concentrations of some of the most toxic particulate matter in major urban centers breaking record levels in recent years on bad days. Part of the problem is the incredibly high penetration of diesel engines in passenger cars. Germany registered 3.35 million new cars last year, of which 45.9% had a diesel engine and 2% had alternative (read hybrid or CNG) engines. The reason for this is that regular gasoline is expensive. The cheapest gas I could find in Berlin is $5.56 per gallon. A gallon of diesel is $4.58 per gallon. This difference is not due to the underlying cost of the fuel but the fact that diesel is taxed at a significantly lower rate. The reason European diesel cars are dirtier than Calif/US is that in US we require all cars, diesel or gasoline, to have the same low standards. In Europe, they have always had more lax [standards for diesel] cars than gasoline cars. As cities in Europe are introducing zones restricted to the cleanest of cars, and some consider banning diesel outright in densely populated areas, perhaps this should serve as a warning on picking technologies in the hope of reducing some emissions, and instead concentrate on standards restricting emissions. Which brings me to Alberta - on the way back to Ontario. The TransAlta press release anticipates, "a reduction of approximately 40 per cent of carbon emissions." This implies approximately 50% more natural gas fuel will be required to produce a unit of electricity with the converted coal units than would be necessary from a modern combine-cycle gas turbine (CCGT) power plant. TransAlta intends on extending the useful life beyond a federally legislated limit - at least if the units remained powered by coal - 2012's Reduction of Carbon Dioxide Emissions from Coal-fired Generation of Electricity Regulation (SOR/2012-167) caps new plant emissions at an average intensity of 420t/GWh (CO2e) and limits the operational life of existing power plants. TransAlta's press release hints emissions from the converted units will be 50% above that intensity limit. Conversions of similarly sized coal-fired power plants confirm a smaller reduction for carbon dioxide than a full plant replacement would achieve - and a limited reduction in nitrogen oxides. I only saw cheering for TransAlta's announcement; the cheerers seem to be against organic sedimentary rock to a greater extent than they are for cleaner air. Conversion of existing units to burn natural gas promises a 40% reduction in greenhouse gas emissions, whereas replacement with modern natural gas power plants would achieve a 60% reduction. 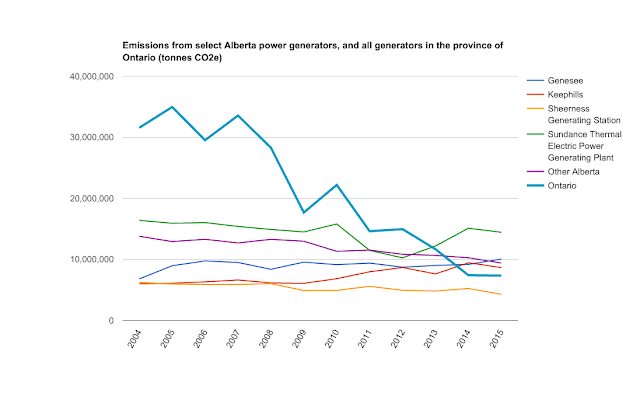 In recent years 20% of the emissions from the 4 Alberta coal-fired power facilities TransAlta has some position in (Genesee, Keephills, Sheerness and Sundance) has been equivalent to all emissions from all power plants in Ontario. From my Ontario perspective a 40% emissions reductions from coal-fired power plants is a poor effort, where 60% is obviously attainable. Another hint that things are a little out-of-control in Alberta is that while TransAlta made this announcement to run dirtier coal-fired power plants longer after converting to gas, it omitted from the announced conversions its newest, and I presume lesser polluting, units (Sheerness, Keephills 3 and Genesee 3) which may be shuttered in 2030 because of an agreement through which the Alberta government agreed to pay them to do so with the proceeds of a carbon emissions fee. The European diesel experience is one example of championing a technology over championing standards. 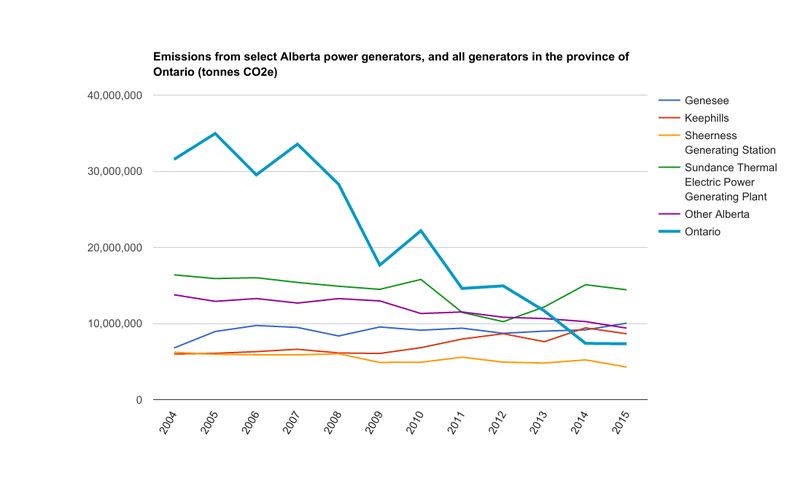 Apologist for continuing Alberta's history of relatively high electricity sector emissions should not be heeded in allowing the extension of coal units beyond the legislated period through a coal-to-gas fuel trick. At least not without restricting the hours plants can operate. In Ontario, necessary capacity to meet NERC reserve requirements is largely provided by the Lennox Power Plant, which can burn oil or natural gas. It's unfair to compare the emissions intensity of the two because they operational profile was far different, but I'll do so anyway because the legislated rate (420 tCO2/GWh) was set assuming intermittent operation. 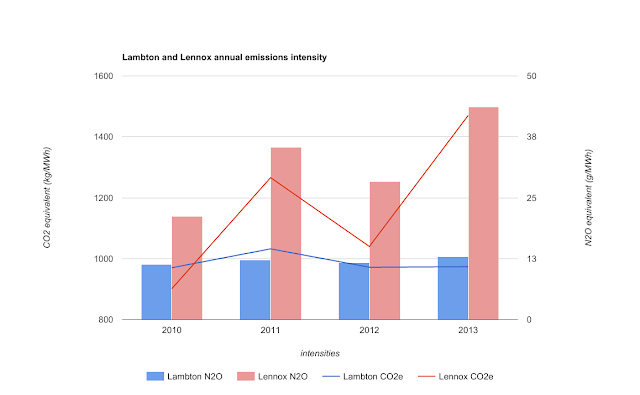 Lennox had higher emissions, per unit of electricity generated, than coal-fired Lambton did during its final years of operation. The Lennox power plant entered operation around 1976 - so its 50 year run will end 2026, unless its owner (OPG - essentially the province) seeks the same exclusion from standards Alberta's coal-to-gas conversions would need. In my opinion no exclusions are warranted, but if any are granted, they should carry maximum annual run-times (ie. 100 hours). The manufactured hatred for organic sedimentary rock (coal) should not be allowed to justify high levels of greenhouse emissions, nor the unnecessary pollution of local air-sheds with the nitrous oxides that are an important ingredient in smog.